It is a phenomenon that has perplexed even energy experts. There are fewer drivers on U.S. roads, Americans have cut back spending -- including gasoline purchases -- and unemployment is nearing 10 percent. And yet, the price of gasoline continues to rise heading into summer. Gasoline prices have risen for 41 days in a row, to a national average of about $2.62 per gallon, The New York Timesreported Tuesday. In the fall 2008, gas prices hit an average low of $1.61 per gallon. That's a whopping 61 percent increase -- an enormous rise, even in a healthy, robust U.S economy, let along one that's (hopefully) bottoming amid its worst recession in more than 25 years. What's more, average prices in high-cost areas (New York City, San Francisco, Los Angeles, and much of the Midwest), are approaching $3.00 for regular unleaded. Further, the surge in gasoline prices is far larger than the typical increase that occurs as the summer driving season begins, when Americans have historically driven more because they spend more time outdoors and take summer vacations. Part of the reason -- and a major reason the Midwest is seeing very high gasoline prices -- stems from the fact that several refineries in the Midwest had temporary maintenance delays and problems, including the large BP (BP) refinery in Whiting, Indiana, which has had to retool its refinery system to accommodate fuels from Canada's oil sands, The Timesreported. That has led to lower supplies, particularly in the Midwest, boosting gasoline's price. "You are entering the highest demand season of the year with tight supply, and that supply may not catch up with demand until the fall," Lewis Adam, president of ADMO Energy, a consulting company, told The Times. Economist Peter Dawson concurred, arguing that the nation is still being hampered by a too-small refinery system, and by a generation of inefficient SUVs and cars. "We have a bottleneck in the refinery network for key, formulated gasoline grades." Dawson told DailyFinance Tuesday. "All it takes is a couple of refinery fires, or an extended shutdown at a big refinery and that will send prices jumping 30, 40 cents in the summer." The nation hasn't opened a new refinery since the 1970s, he said, and with a fleet of mostly larger vehicles, the U.S. "is still consuming too much gasoline on a per vehicle basis." Two other factors pushing gasoline prices higher are the higher price of oil (obviously) and investment funds, Dawson added. The price of oil has roughly doubled in six months to about $68-89 per barrel on the belief the U.S. and global recessions are starting to bottom. Meanwhile, institutional investors, chasing return, have increased their oil and gasoline futures positions, further boosting gasoline's price. Is there a silver lining to gasoline's dark cloud? Dawson said there is. If demand remains moderate-to-light, as expected, and if oil prices plateau, "we're probably near our high for gasoline prices for the summer," he said. Once refiner repairs are made, refiners will lower their prices to reflect lower demand this summer, due to the recession, he added. 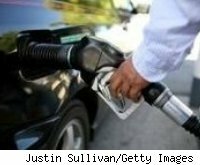 Economic Analysis: From an investor's standpoint, that gasoline price drop can not occur soon enough for the U.S. economy: Gasoline prices at current levels can add $500-$1,000 to an American's yearly gasoline bill -- an extra expense or de facto 'tax' that takes money away for other purchases, reducing GDP growth. Budgets are tight to begin with, given the recession: Sustained high gasoline prices would remove what little disposable income remains for many Americans, perhaps delaying the U.S. economic recovery.